I made an easy prediction in 'Chasing Coral': awards and nominations and looking forward to next year's Emmys 4 last December. I expect I'll be able to tell my students about "Chasing Coral" earning an Emmy nomination for Outstanding Nature Documentary next summer and its likely win in the fall. I'm looking forward to that. That happened, as "Chasing Coral" earned a nomination for Outstanding Nature Documentary at the News and Documentary Emmy Awards along with nominations in two other categories, Best Documentary and Outstanding Music & Sound. It is competing with "Putin's Revenge" on Frontline, "The Witness" from Independent Lens, "Life, Animated," an Oscar nominee for Documentary Feature in 2017, and "My Love, Don't Cross That River" from POV for Best Documentary. Out of that field, I'm rooting for "Chasing Coral," but "Life, Animated" is very tough competition. That written, both "Chasing Coral" and "Last Men in Aleppo" have already won a prestigious award for documentaries, the Peabody Award. Here is the award profile for "Chasing Coral." Climate change is often described as a slow-moving catastrophe, a serious yet distant threat. “Chasing Coral,” a Netflix documentary, upends that comfortable premise. 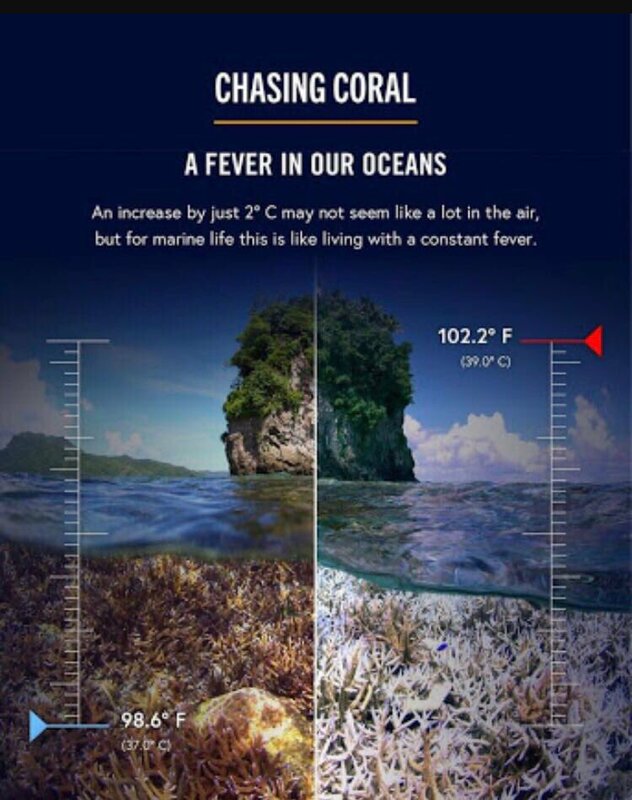 As waters warm, coral reefs starve, with massive bleaching events occurring at record pace unseen beneath the waves. Approximately 90 percent of coral reefs may be lost over the coming decades. “Chasing Coral” dramatically illuminates this ongoing disaster, first immersing the audience in the gorgeous and diverse marine world that is the Great Barrier Reef, and then documenting—using underwater time-lapse cameras invented specifically for the project—how vast swaths of it die. The emotional impact is heightened by watching a team of passionate scientists and idealistic young assistants witness the bleaching event, which suggests nothing less than a kind of underwater holocaust. Somehow, in spite of the scope of the tragedy, the documentary nevertheless remains hopeful, calling for engagement and urging action. For bringing climate change and its deadly consequences into sharp and immediate focus, “Chasing Coral” wins a Peabody Award. And now, director Jeff Orlowski's acceptance speech. "A story that matters because the Earth matters" — indeed, it is. Follow over the jump for the other nominees competing against "Chasing Coral" in the other two categories. While I think that "Chasing Coral" is the favorite for Outstanding Nature Documentary, I also think its main competition for that award is the "Nature" episode "Yosemite," which also has three nominations at the News and Documentary Emmy Awards and also examines the effects of climate change, this time on my favorite National Park. Watch YOSEMITE on NATURE | Official Trailer | PBS. The Sierra Nevada, a mountain range running about 400 miles along the eastern side of California and stretches into Nevada, is home to three national parks: Sequoia, Kings Canyon and Yosemite. This is a land of giants, whether speaking of trees soaring to nearly 300 feet, or massive stone monoliths far taller than any skyscraper. But the force that has given rise to the earth’s largest living trees and carved out the iconic natural landmarks of the Sierras is water. The role that water has played in the creation and evolution of Yosemite Valley cannot be overstated – feeding its numerous wild rivers and countless waterfalls, and making life in this stone wilderness possible. The second force, crucial to the Giant sequoias’ ability to reproduce, is fire. It is the delicate balance of these two elements, water and fire, that is vital to the continued existence of the wildlife and trees that inhabit the Sierras. Despite the recent heavy rains and snowfall, scientists are finding that water is scarcer and the threat of fire is more likely as the area continues to experience rising temperatures upsetting that important balance. Geologists, ecologists, researchers and adventurers investigate how the changing climate is affecting Yosemite, one of America’s greatest wildernesses. CBS This Morning has even more in Documentary explores how climate change is impacting Yosemite. PBS' "Nature" series will premiere "Yosemite," a sublime look at one of our nation's most stunning national parks. It's also a sobering one, as the park's ecosystem is threatened by climate change. Award-winning nature filmmaker Joseph Pontecorvo, who produced, wrote and served as a cinematographer, joins "CBS This Morning: Saturday" to discuss the filming process and the park's future. The camera work is indeed lovely and captures the beauty of Yosemite National Park, which is why I think "Yosemite" has a good chance to win Outstanding Cinematography: Documentary. There, it faces another nominee for Outstanding Nature Documentary, "Ireland's Wild Coast" for its second nomination. This is my third choice of Outstanding Nature Documentary. The other nominees in this category, fellow "Nature" episode "Naledi: One Little Elephant" and "Independent Lens" episode "SEED: The Untold Story," only have the one nomination for nature documentary. The other nominees for Outstanding Cinematography: Documentary include the "Frontline" episode "Mosul" and the "Nature" episodes "Forest of the Lynx" and "Spy in the Wild: A NATURE Mini-series." "Mosul" also has a nomination for Outstanding Short Documentary, but the two "Nature" episodes only have the nominations for cinematography. Given the field, my comment last year that nature documentary nominees are well photographed at the News and Documentary Emmy Awards is still true. For their third nominated category, both "Chasing Coral" and "Yosemite" are competing for Outstanding Music & Sound along with the HBO Documentary Films "Cries From Syria" and "The Music of Strangers: Yo-Yo Ma and the Silk Road Ensemble" and the "Independent Lens" episode "Tower." The most formidable overall are "Cries from Syria," which also has nominations for Outstanding Current Affairs Documentary, Outstanding Writing, and Outstanding Research, and "Tower," about the first mass school shooting in U.S. history at the University of Texas, which earned a nomination for Outstanding Historical Documentary as well. * However, I suspect "The Music of Strangers: Yo-Yo Ma and the Silk Road Ensemble" might be the fiercest competitor for Outstanding Music & Sound; it also earned nominations for Outstanding Arts & Culture Documentary and Outstanding Editing: Documentary. Still, I'm pleased "Chasing Coral" has this nomination, as it is the closest thing at the News and Documentary Emmy Awards to what I hoped it would get elsewhere, nominations for "Tell Me How Long" for Best Original Song at the Academy Awards and Outstanding Original Music and Lyrics at the Creative Arts Emmy Awards. The song didn't earn either, so I'm not embedding it again. However, I am including my favorite instrumental from the soundtrack, An Alien World, to conclude this entry. *I've already promised to write entries about the nominees examining the opoid crisis and the Syrian Civil War. I plan on writing one about the nominees reporting on mass shootings as well. Stay tuned.